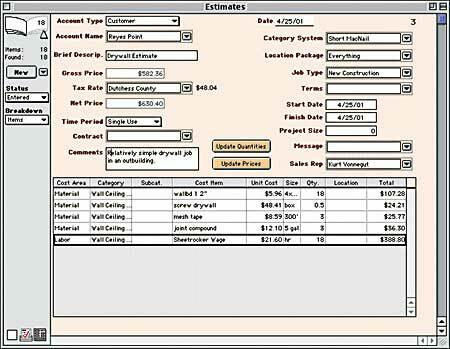 Turtle Creek Software out of Ithaca NY has been producing construction estimating software and construction accounting software, since 1987. (About Turtle Creek) Indeed my first introduction to estimating software on the Mac platform was with their now defunct Excel spreadsheet based product MacNail. In 2000 Turtle Creek introduced Goldenseal as their new flagship product. The basic core Estimating package of Goldenseal ($395 for single user) has tools for estimating, scheduling, contract writing, project and business management. They also have a more comprehensive package ($695 for single user) that also has software tools in it for job costing, general accounting, payroll, billing, tracking inventory, as well as rental property management and retails sales. Goldenseal runs on both Mac and Windows platforms and also comes in multi-user versions too ($995 for two users, $1295 for five users, $1795 for up to 10 users, and $2495 for up to 20 users. Add $50 to get Goldenseal on more than one platform , ie. both Mac and Windows). 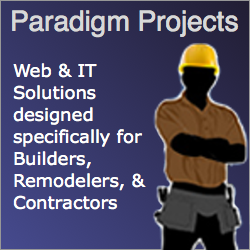 The software also comes with several sets of “starter” unit costs such as a Construction Starter File with unit costs for new construction, remodeling and repair estimates, a Paint Starter File with unit costs for painting and paint preparation, a Drywall Starter File with unit costs for drywall, taping, plaster and stucco estimating, and a Framing Starter File with unit costs for framing contractors doing wood and metal stud framing.